things a homeless hitchhiker might have. For Visual Communications class, we are attempting to communicate two-word stories with only fundamental objects; my original two words were, homeless hitchhiker. Although, our class brainstormed some potential object ideas, we were individually able to guide the connotations of the story. To me, the idea of hitchhiking is leads to a romantic theme of adventure, rather then a lonely, street person, lacking means. I have decided to leave out the whiskey, axe and box (from the original list). The next step for this story-telling project was to research and compile pictures of the objects. (This is the fun part.) I ventured to the library for books on nomads and maps, ran up to a homeless person and asked if I could take his picture, traded another homeless man a chocolate chip cookie for his money cup, scoured a few thrift stores for objects I could photograph and called my traveling friend, Rainbow, to set up a photo shoot. 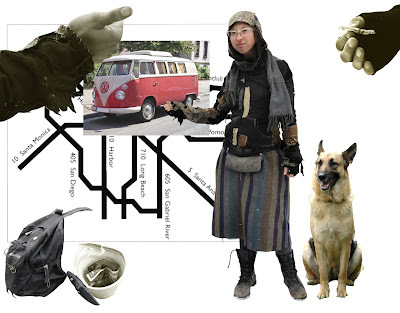 Below is a mood board (of sorts) of my photographs (although the dog, map and bus were acquired from the internet). During the photo shoot, a gloriously, serendipitous moment on Main street. Sadly the bus did not pick Rainbow up. We placed the photographs of the objects into book form as a reference for drawings to be made. Casting light to the theme of the story was also a goal for the reference book. I chose a worn, leathery paper for the cover material and black, waxed thread to emphasize appearance of a hand-made, travel journal. Each page displays a background image of a map to also connote journey. The following are a few pages from the book. 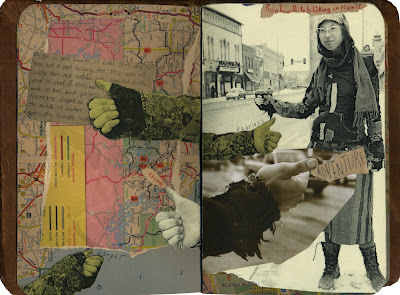 This layout consists of thumb shots of my friend, the map background, a scene of her hitchhiking on Main st., as well as a excerpt about hitchhiking from one of her travel journals. For the cigarette layout, I photographed a friend holding a rolled cigarette. Since a nomad is typically cautious with money, I thought this type of cigarette would give the appropriate connotations. 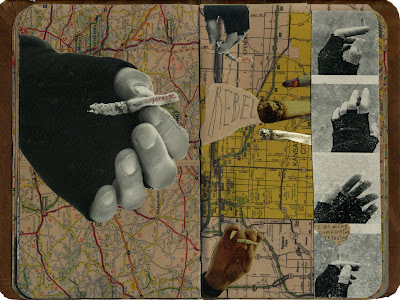 Also, one of the cigarettes is screaming, “rebel”; the traveler is rebellious to the structure and normalcy of society. For this layout, I recruited Rainbow holding the knife that she typically carries on her belt strap. 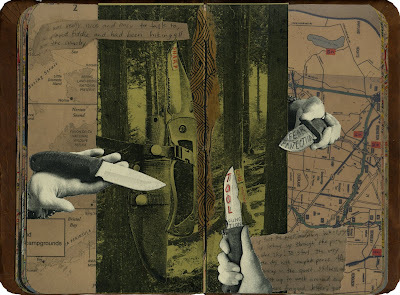 The woods scene is to propose a hiking/camping theme, allowing the knife to represent more function than fear. I also added journal text about camping and hiking. The process of gathering visual evidence has allowed me to learn more about a friend. (What could be better?) Her stories are enamoring. I am also becoming more and more tempted to pursue even a short experience of this lifestyle. This is hilarious. I see a lot of homeless people in Downtown Las Vegas and it is always interesting to hear their stories.